“[. . .] supplemental heatsinking of the KX3 is *not* needed for typical digital-mode operation with the KX3. PSK31, RTTY, etc. will all function “out of the box” on the lower bands (20 meters is by far the most common band for digital communications). Trading heft for convenience the KX3 provides ample heat dissipation for the “usual” SSB or CW operating environment and cleverly implements a software frequency stability mechanism should incidental oscillator warming occur. By usual of course I mean a transmission duty cycle or power low enough for modest heat generation by those two small final transistors. For any assumption anyone can make about how customers will use products, some make their gear Go to Eleven. So it goes with the 100% duty cycle digital crowd. I’ve not personally done digital with my KX3 yet, but am listening carefully to the threads on the KX3 forums about restricting power to accommodate digital modes. Thankfully the Elecraft customer base is a rather useful pool of talent resulting in the creation of various aftermarket mods for the KX3. Such is the case with the SideKX panels and cover which I immediately purchased the very instant they came out. There are two themes regarding the KX3 and heat: Handling heat flow form the final transistors and managing the heat around the oscillator to improve frequency stability. The narrowband digital folks are wary of any frequency stability issues, but the KX3’s built in compensation system is a good step forward. Regardless, W7GJ deals with both the finals’ heat and oscillator stability with two distinct solutions. What appeals to me most about the PAE-Kx31 is the amount of actual thermal engineering backing up the design decisions along with test results. This combined with the no-sharp-edge design made the purchase of this make and model a no brainer… if I really need a heatsink. Does my KX3 really need a better heatsink? Again I venture to say the folks at Elecraft know what they are doing about thermal management. That said, I have been designing electronics long enough to have “blown a few” components due to heat. One Altera EPLD actually cracked open and spit out flame. Needless to say, I didn’t read the fine print about thermal management on page 18 of the Altera datasheet. I fixed that with a revision to the design, but I have always been a bit sensitive to the topic ever since. In another instance I satiated some JPL folks’ concerns about moving a hot regulator with heatsink from directly over VME cage fans to just 5 inches away. I conducted an experiment where I proved a fan one YARD away provided well over half the cooling capability. The slightest breeze pays big dividends, but fins make this much more effective. While I commend Elecraft for designing their KX3 RF circuit to use transistors with “grounded” tabs, halleluiah, I never really got past the idea of not using heatsink compound between those two final transistors and the base heatsink. Shudder! I knew I would eventually put some compound on those finals, but the well thought out PAE model makes good sense. For me an improved heatsink made the cut. I ordered a PAE-Kx31. Heatsink compound gets everywhere. Keep a paper towel handy and only use little pieces of it to mop up smears and then throw it away. If you don’t you’ll forget and wipe the stuff over something else. Option 2 requires some dis-assembly of the KX3 bottom portion. When I re-assembled everything with the new heatsink in place, I noticed the two-pin antenna connector below the board… sigh. I had to remove the heatsink and other things to get it out. When I did, the heatsink screw at the antenna end jammed. I had to fix the threads with my 4-40 die. 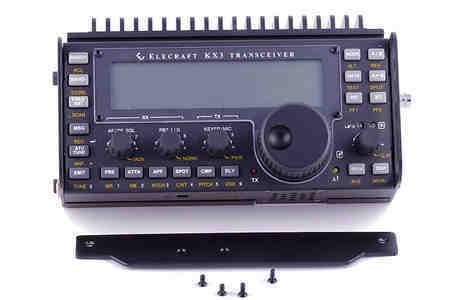 Elecraft KX3 Heatsink modification – Worth it? It is for me. I know enough about electronic design and reliability analysis that cooler components last longer. Even if I never run digital, the tests at Pro Audio Engineering reveal the superior heat flow keeping those finals as cool as possible with a passive heat management system. My pimped KX3 with the PAE-Kx31 (top) & the parts it replaces. In case anyone wonders… yes this still slides into my orange satchel by Rose’s covers with great ease. The round, snag-free, lines of the PAE-Kx31 pay big dividends here. I believe the aftermarket PAE-Kx31 KX3 heatsink by Howard (WA4PSC) of Pro Audio Engineering achieves the proper balance of performance, size, shape and mass for those seeking high duty cycle digital modes or high reliability for all modes from their Elecraft KX3. For the “every gram is sacred” minimal mass folks, the careful engineering of the PAE-KX31 offers, in my assessment, the best performance per gram of the models I examined. I don’t have hard data on this assessment, however. Howard accomplishes this with a round-edge, snag free design that won’t tear or rip your preferred KX3 carrier. The heatsinks from the other manufacturers likely provide similar benefits so let your conscious be your guide. Some of the larger and seemingly more massive models do seem to achieve “slightly better” thermal performance as suggested in this independent test; The top three are close in performance and likely within the unreported margin of error. Assuming the results of the top three are basically identical, one can assess performance vs. other variables. Some have examined performance vs. cost. I’m more interested in performance vs. mass. The PAE-Kx31 keeps pace with its heavier and larger counterparts while maintaining sleek proportions, rounded edges and unobtrusive appearance; The engineering optimizations are obvious. I know the value of thermal modeling in my line of work and the PAE-KX31 hit the right buttons for me. Any of the top three in the independent test will greatly improve the thermal characteristics of your KX3. Viva la choice! Aftermarket Upgrade Heatsink Alternatives for the Elecraft KX3 Transceiver, Adrian Ryan, 5B4AIY. Thanks for the recommendation, I'm considering a heat sink for my KX3. Olivia is the worst, I always get a thermal shutdown after just a few minutes if I run more than 3 watts. Went ahead and purchased one. Installed it with Option 3 (removing powder coat from case using Dremel sanding tool) this afternoon. Tested with constant CQ loop running Olivia 16/500; 5W output; 1.6A @ 12.6VDC input; dummy load (1.0:1 SWR); 14.09 MHz; indoor test with ambient temperature 80 F. With stock heat plate took 4.5 minutes to go from PA temperature 31 C to 60 C (thermal shutdown). After installation same conditions required 22 minutes. Definitely pleased. Option 2 is the case where KX3 case paint/power-coat remains. That's what I did and it seems to work fine. WB0OEW chose option 3 that removes the paint. There's no question that's the better approach, but the large contact area reduced my concern about the paint layer. I wouldn't consider your option 4. The transistor to case thermal contact area is the smallest so lowering the thermal resistance here every little bit helps. Once the heat is in the case, however, it spreads out and makes contact with the external heat-sink (be it the stock or the PAE model) over a much larger area. Bare metal and paste help here as well, but at least the thermal resistance is manageable due to the large contact area.